Woodbine Legacy Investments (WLI) has completed a $20 million renovation on W Atlanta-Buckhead, a 12-story, 291-room full-service luxury hotel in Atlanta’s affluent Buckhead neighborhood. The renovation launched in May 2018 and was finished just weeks before the city will host the 2019 Super Bowl LIII. Woodbine hired C+TC Studio of Atlanta as the architect and interior designer for guest rooms and the hotel’s rooftop bar, Whiskey Blue; STUDIO 11 of Dallas as the interior designer for the lobby, public areas and meeting space; and Genoa Construction as the general contractor for the project. In 2018, the hotel celebrated 10 years of tenure as a W destination—making the renovation well-timed with that milestone moment. Taking cues from the city’s bent toward fashion, design and art, the renovation included an infusion of splashy artwork and murals throughout the hotel and at the rooftop bar, Whiskey Blue. Woodbine worked with its partners to source local talent both to enliven the guest experience and strengthen the connection to the community, specifically the Buckhead neighborhood and the city of Atlanta. Guest Room Art by Lela Brunet: Lela Brunet’s prints add pops of vibrancy to each of the updated guest rooms. An artist, muralist, designer and native Georgian whose work has been showcased across Atlanta, Brunet is known for her compositions that contrast soft female figures with energetic patterns and collisions of color and texture. Her contemporary, striking style made her work a perfect complement to the renovated guest rooms of the fashion-forward W Atlanta-Buckhead. Pool Deck Mural by Greg Mike: Greg Mike’s mural adds a compelling backdrop and splash of color to the hotel’s rooftop pool deck. Mike is celebrated for his surrealist, pop-art-inspired work that focuses on the playful world of cartoons—often in juxtaposition to the serenity of the surrounding nature. A street artist and muralist, Mike is known locally for his Larry Loudmouf character, an Atlanta icon that can be found throughout the city—through which Mike shares thoughts and sayings inspired by local residents. His outdoor mural brings a splash of the bold, urban aesthetic up to the hotel’s pool deck. Living Room Mural by Chris Veal: A native Georgian and one of Atlanta’s most recognizable muralists, Chris Veal was commissioned to create a mural in the W Atlanta-Buckhead Living Room—a backdrop against which guests can capture “Instagrammable moments” with their own phones as well as the W photobooth camera. Veal began painting in the early 2000s and has become a voice for Atlanta through his thoughtful commentary and eye-catching art, earning both local and national acclaim. To reflect the upscale nature of the hotel, the fashion-minded of Buckhead and the Southern charm of Atlanta, Veal integrated a bow tie among the mural’s elements. Images taken in front of the mural will be looped to the hotel’s Instagram account and displayed on an adjacent Polaroid-style screen—creating a real-time art experience that highlights the mural and people’s interactions with it and each other. Whiskey Blue Mural by Chris Veal: Veal was also hired to design a statement mural for the 66-foot-long walkway that leads to Whiskey Blue, the W Atlanta-Buckhead’s award-winning rooftop bar. His retro, pop-inspired work brings a fresh, modern twist to the newly renovated Whiskey Blue and is an important reflection of the ever-evolving Buckhead neighborhood. 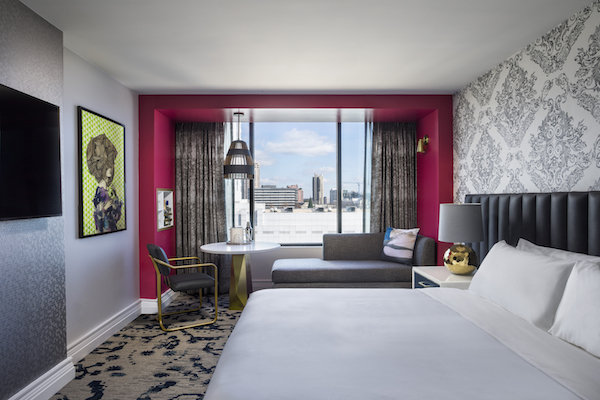 The W Atlanta-Buckhead’s top-to-bottom revamp included: the addition of a dedicated welcome area for the Whatever/Whenever concierge team; new furnishings; and a café-style seating arrangement that lends well to work or R & R for individuals and groups alike. The new, flexible layout flows easily from day to night, providing a calm, comfortable and swanky space by day and a dynamic, energetic setting with a DJ booth by night—always showcasing fashion, art, music experiences and more. In the lobby/living room, the custom installation/mural by Chris Veal is the backdrop for the W photo booth. Images taken in front of the mural will be looped to the hotel’s Instagram account and displayed on an adjacent Polaroid-style screen—creating a real-time art experience that highlights the mural and people’s interactions with it and each other. The hotel’s 11,000 square feet of flexible indoor/outdoor function space received new furnishings, paint, carpeting, lighting and artwork, along with enhanced spaces for breakout sessions and pre- and post-function events and activities. The fitness center got a new look with refreshed surfaces and updated artwork, while maintaining great views of the city. Internet throughout the meeting space and entire hotel was also upgraded. Guest accommodations—286 guest rooms, 4 WOW Suites and 1 EWOW Suite—were enhanced with new headboards, armoires, sophisticated damask wallcoverings and carpeting, 55-inch televisions, in-room Nespresso machines and beverage bar, and vivid artwork throughout. All guest rooms showcase splashes of color and an unexpected blend of graphic and sophisticated elements to create spaces that are energizing, inspiring and comfortable. The renovation also removed air-conditioning window units from all guest rooms, decreasing system-related sounds—also making room for a window portal and new work/lounge area with a chaise, a cozy table and a cocktail cubby. Guest bath updates included bold wallcoverings and new, glamourous sliding glass doors for augmented privacy. Guest room corridors also have new wallcoverings, carpeting and lighting throughout. Rooftop bar Whiskey Blue—one of Atlanta’s most popular places to see and be seen—reopened in November 2018. Its refresh included new furnishings, flooring, wallcoverings, lighting, artwork, terrace furnishings and landscaping, as well as changes to the entrance elevator and surrounding rooftop, including Chris Veal’s 66-foot walkway mural. A second phase of renovation will commence in 2019, which will focus on the hotel’s restaurant, Cook Hall. W Atlanta-Buckhead is tucked into the well-known and beloved Buckhead neighborhood, which boasts a 13-million-square-foot mixed-use district with a lineup of best-in-class retail, high-end residential, office, entertainment and lifestyle amenities and more. To learn more, visit www.marriott.com/hotels/travel/atlbw-w-atlanta-buckhead.